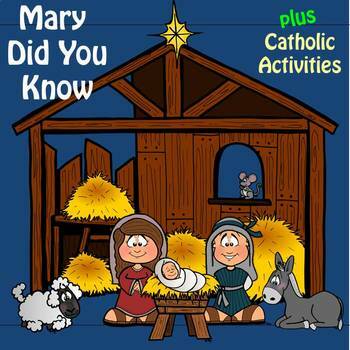 This Activity Packet Connects Music Class with the Religious Teachings of Jesus’ Miracles of Healing, the stories of Creation and The Nativity plus Literacy. Directions: TRACE the letters in each sentence. 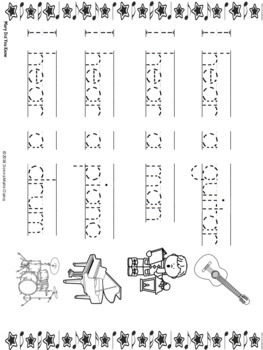 As your students LISTEN to the song, have them CIRCLE the PICTURE of the INSTRUMENT if they hear it. Directions: TRACE the letters in each Musical word. Draw a LINE from the Word to its MATCHING PICTURE. Words are Across, Backward, Up And Down. No Words Cross or Share Letters. Students Color 1 image from each group of 2 images to identify the Section they are listening to. In this lesson, students need to UNSCRAMBLE each word. In this lesson students will count the Pronouns they hear as they listen to the song. Students will Read Bible Passages that relate to the song lyrics. 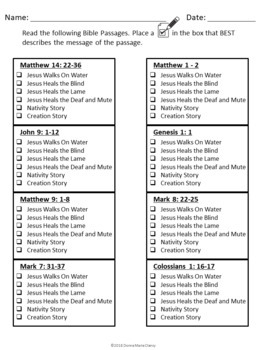 Students will Place a check in the box that BEST describes the message of the passage. Students will Write 3 Questions they would ask Jesus if they had the chance. Students will describe WHY they chose their particular performer. By following my TpT Store. Click on the green ‘Follow Me’ next to my Seller picture. You will receive emails about New products and up coming Sales. Copyright © Donna Marie Clancy. by the Original down loader. Clip Art is Public Domain, Various Graphic Artists credited within the work and Donna Marie Clancy. Intended for classroom and personal use only. It may be pinned to Pinterest but must have a link back to my store.